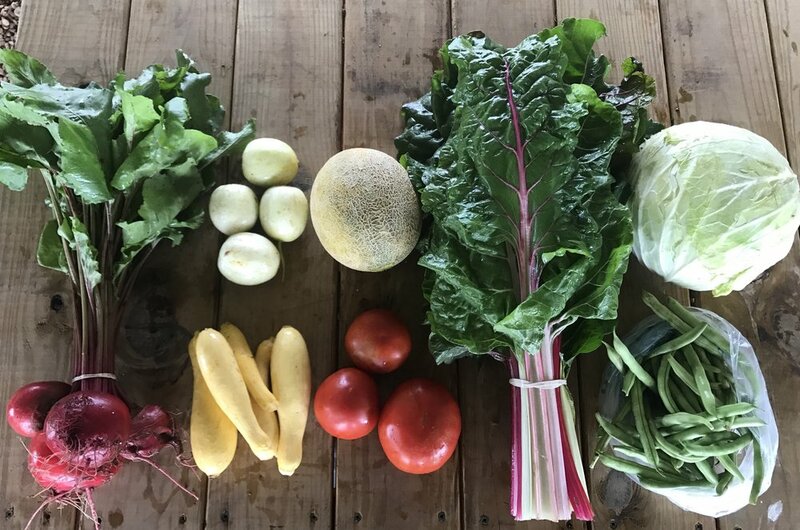 Hey y'all, welcome to week 8 of your CSA! We hope everyone had a great weekend. Hazel and I were in a wedding in Estes Park, Co this past weekend. Hazel was a flower girl, and she did so good throwing flowers down the aisle (proud mama moment). Van actually got to buy a last minute flight and get away with us as well. We had a great time together, but it is great to be home. Hazel has especially been loving the mud holes at the farm. We were really nervous leaving the farm for those 3 days, but with all the rain limiting us anyways, it seemed to be good timing. Now we are ready to continue getting the rest of the onions out of the field and onto drying racks. We have already put up about 1,600 lbs. of onions, and have about 4 times that amount to get out of the field. Unfortunately half of the onions have gone bad because of the excess rain. It is so wet in the fields. Really hoping for some drier weather this next week, or even for a few weeks! 2. Lemon Cucumbers- Heirloom variety that's tender and sweet. Great for salads and pickling. Pictured below is Hazel and Van at the wedding in Colorado. She sure does love her daddy! Then Hazel loving being back at the farm helping give chickens water and playing in the mud holes.